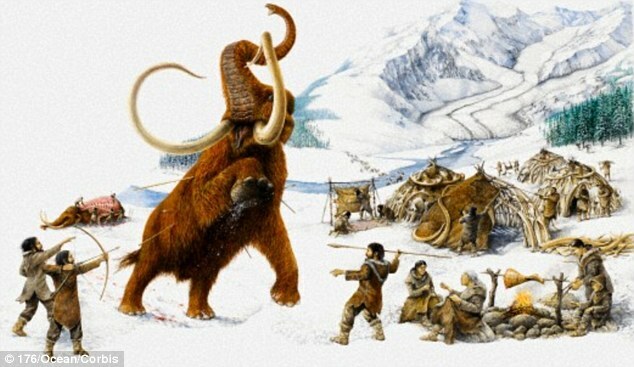 [White people used to hunt Woolly Mammoths (a type of hairy elephant) in Europe! But they may have hunted them elsewhere too! We’ll discuss that later. Mastadon’s are also a type of hairy elephant, but not one as well known as the Woolly Mammoth. Whites in the stone age, actually hunted and killed them and made clothes out of their furry skins. Sit and ponder that. White people even made water-proof clothing, 22,000 years ago … Scientists have found the needles they used, made out of bone! No recreation of the Ice Age would be complete without two or three large, shaggy Woolly Mammoths stomping their way across the frozen tundra. But how much do you really understand about this famous Pleistocene pachyderm? Below, you’ll discover 10 fascinating facts that you may or may not have known about the Woolly Mammoth. As massive as they were (about 13 feet long and five to seven tons), Woolly Mammoths figured on the lunch menu of early Homo sapiens, who coveted these beasts for their warm pelts (which could presumably keep an entire family comfy on bitterly cold nights) as well as their tasty, fatty meat. In fact, there’s an argument to be made that the patience, planning, and cooperation required to bring down a single Woolly Mammoth was a key factor in the development of human civilization! From about 30,000 to 12,000 years ago, the Woolly Mammoth was one of the most popular subjects of neolithic artists, who daubed images of this shaggy beast on the walls of numerous western European caves. These primitive paintings may have been intended as totems (that is, early humans believed that capturing Woolly Mammoths in ink facilitated capturing them in real life) or as objects of worship; or perhaps a particularly talented caveman was just bored on a cold, rainy day! What we call the Woolly Mammoth was actually a particular species of genus Mammuthus, Mammuthus primigenius. A dozen other Mammoth species were extant in North America and Eurasia during the Pleistocene epoch, including Mammuthus trogontherii (the Steppe Mammoth), Mammuthus imperator (the Imperial Mammoth) and Mammuthus columbi (the Columbian Mammoth). However, none of these Mammoths attained as wide a distribution as their woolly relative. 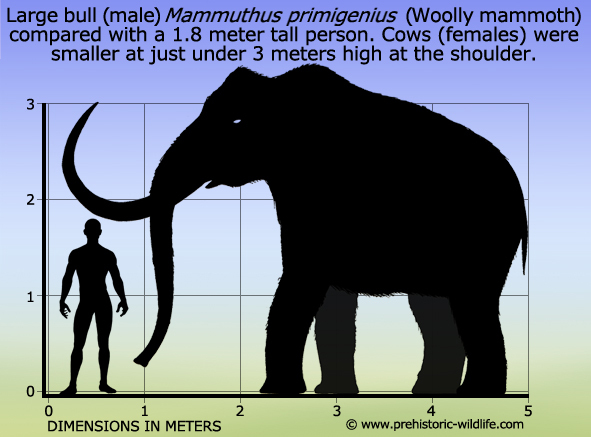 Despite its imposing reputation, the Woolly Mammoth was actually outclassed in bulk by a few other Mammuthus species. Imperial Mammoth (Mammuthus imperator) males weighed over 10 tons, and some individuals of the Songhua River Mammoth of northern China (Mammuthus sungari) may have tipped the scales at 15 tons. Compared to these behemoths, the five- to seven-ton Woolly Mammoth was an insignificant runt! By the end of the last Ice Age, about 10,000 years ago, pretty much all the world’s Mammoths had succumbed to climate change and predation by humans. The exception was a small population of Woolly Mammoths that lived on Wrangel Island, off the coast of Siberia, until 1700 B.C. Since they subsisted on extremely limited resources, Wrangel Island Mammoths grew to much smaller sizes than their Woolly Mammoth relatives, and are often referred to as dwarf elephants. Even today, 10,000 years after the last Ice Age, the northern reaches of Canada, Alaska, and Siberia are very, very cold–which helps to explain the amazing number of Woolly Mammoth individuals that have been discovered mummified, near-intact, in solid blocks of ice. Identifying, isolating and hacking out these giant corpses is the easy part; what’s much harder is keeping the remains from disintegrating once they reach room temperature! Because Woolly Mammoths went extinct relatively recently and were closely related to modern elephants, scientists may be able to harvest the DNA of Mammuthus primigenius and incubate a fetus in a living pachyderm (a process known as “de-extinction“). Update: a team of researchers recently announced that they have decoded the near-complete genomes of two 40,000-year-old Woolly Mammoth specimens. Unfortunately, this same trick won’t work for dinosaurs, since DNA doesn’t preserve well over tens of millions of years. all the mega fauna seem to have died out around 10-20,000 years ago, approx when earth was ripped from its orbit of Saturn when Saturn was captured by the present sun. The earth gravity when orbiting Saturn was much lower, permitting mega fauna and (earlier) enormous dinosaurs to flourish. But they could not even stand up or support their own necks in the present gravity. Are they doing this de extinction with humans ?